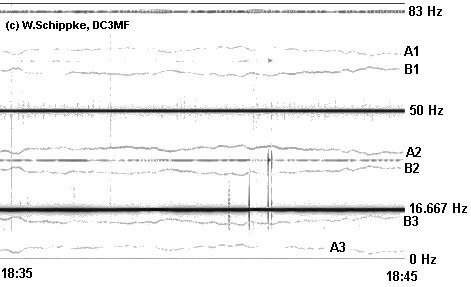 Picture 1) On measurements below 80 Hz we observed several symetrical events marked in the picture as A1...A3 and inverted lines marked with B1...B3. These lines ar not explained jet, like the four spites running from 14 to 26 or from 15 to 34 Hz round 18:42 MEZ. During the same time as the four sprites were seen between A1 and B1 lines a strong point is seen on 67 Hz. It is possible that these lines A1 to A3 and B1 to B3 are in direct correlation to the strong 16.667 Hz from the railway, but the railroad is some more than 700 meters away from the station. These reception was made with a longwire antenna, round 55 m long and about 8 meters above ground. The antenna signal comes via a 1:100 induction into a FET amplifier with 2 x BF 245C. The lines could be shown mainly in the afternoon hours, but not during the night or during the forenoon hours. Picture 2) On the 31th of January we made a special measurement test with a new software and found these event - a small, real variable line running between 0.2 and 5 Hz. After stoping the test round 18:45 UTC, we could observe the signal some more minutes, till it decreased an runned towards 0 Hz. These kind of signal could not longer observed. Picture 3) In the afternoonhours of the 23th December 2000 we observed these soundings between 15:05:00 and 15:05:20 UTC. 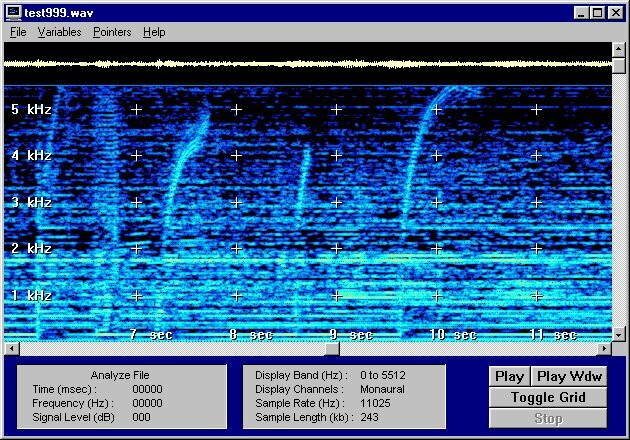 Several groups of sounds hearing like a chirp, could be measured and heard below 5.5 kHz.